"Hmm. We seem to be out of water," I observed to myself with a mouthful of toothpaste and face full of soap, spitting white toothpaste/soap specks at the mirror at a rate that would have made Sheldon Cooper cry. I was turning the taps on and off, but getting no response. Interesting. "What do you mean we're out of water?" my husband asked sleepily, still in bed. "We're out of water," I repeated, stumbling through the hallway, blinded by the soap in my eyes. Did you know it's possible to run out of water up in the North? I didn't. Actually, I should have known it might happen, because occasionally I've seen colleagues coming to work with a toothbrush and dart into the office bathroom, followed by urgent phone calls to the city. Sometimes the sewage system will freeze too, which shouldn't really surprise anyone with the -56°C winter we've been having. But anyway, now it had happened to us, and I was left standing over the sink, wondering how to get the water back on. But more importantly, how to get the soap off my face so I could get the water back on. The ground is often too frozen up here in the Arctic to be digging complex piping systems. Instead, we have our water delivered to us by truck, and our sewage also carted away by truck. Usually, the system works pretty well and you never even notice a thing. But sometimes you'll use up a bit more water than usual, or the delivery trucks get mixed up and go to the wrong house, or there'll be a bad storm and the trucks aren't able to make it through. Then you're left on your own, looking for water. there are a lot of tough jobs up here. This city worker is climbing up a frozen electric pole to do repairs. Where on earth could I get some water so I can wash the soap off my face? The store was too far, and besides, I'm not going to walk through town and earn the nickname soap face. Then I remembered that we lived in the Arctic, it was winter, and there was free water every where. In the form of ice and snow. And that's how I found myself kneeling in the snow bank outside my house, scooping snow into every pot and pan we had in the house. 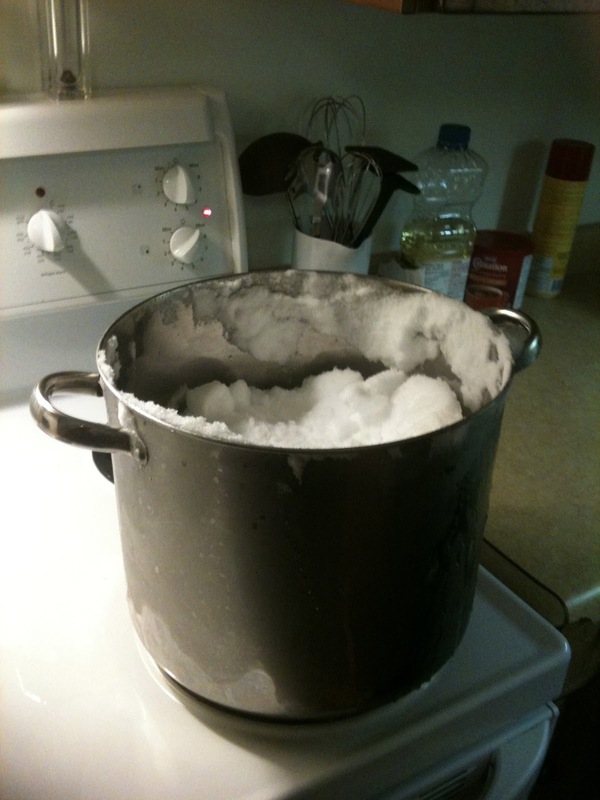 We melted the snow on the stove. Imagine that: getting water by melting snow. I felt like freaking McGyver. Survivorman! SurvivorLawyer! As it turned out, getting the water delivery truck to come wasn't very hard at all - we just made a quick phone call. Soon enough we had all the water we needed, plus one more Arctic life lesson: always keep a couple of bottles of water handy, just in case the water runs out again and you're in the middle of your morning rituals. We decided to go for a nice little hike across the bay on Sunday afternoon. It was a lovely sunny day. Of course, it was also -50°C with the windchill, but if you want to hike in warm weather in Cambridge Bay, you might have to wait possibly forever. 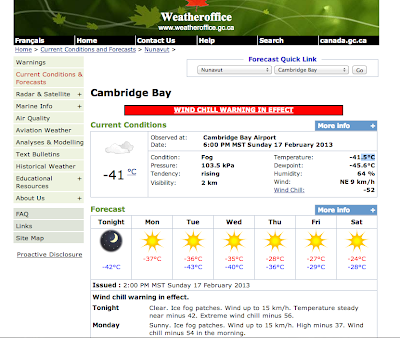 Besides, -50°C was a tad bit warmer than the -55°C it's been all week. We had heard that there was the ruins of an old stone church on the other side of the bay, and we figured it might be a fun place to explore and have a little mid-winter picnic. Our route took us right over the frozen Arctic Ocean, which was pretty cool. "Do you think the ice will be frozen enough?" said my colleague when we planned the trip. I held my breath. Then everyone burst out laughing. The ice is frozen enough in November. The ice is frozen enough in April. The ice is always frozen enough. It's hard to believe there's a whole ocean under there. this looks like a big field of snow, but this is actually the frozen Arctic Ocean. You can see my little town of Cambridge Bay off in the distance. And so we set off. There wasn't a clearly marked trail or anything to follow - with a wide expanse of nothingness, you can pretty much just make your own path to your destination, as long as you keep an eye on the direction you're heading for. It was a beautiful hike. The wind had traces intricate patterns in the snow, and you could see little rabbit footprints, followed by much larger footprints of bigger, possibly hungrier animals. The snow on the ice wasn't very deep, and our footsteps made an interesting hollow crunching sound as though we were walking on styrofoam. It kind of felt like we were walking on a big styrofoam moon. With my thick Canada Goose jacket, triple layer of long johns, jeans, and snowpants, plus my huge Baffin moonboots, I kind of felt like an astronaut, walking on a heavy planet. this motor boat is also frozen into the snow, but I suspect someone actually uses it in the summer. Finally, as we crossed the bay, we caught sight of the old stone church, and made our way up the hill. The town of Cambridge Bay used to be located here, where the ruins are, before it was all moved to the other side of the bay. The church was built in the 1950s out of the materials that they had available there: frost shattered rocks held together with seal oil and clay. Some years ago, somebody set fire to the church to destroy it, and now all that remains is the foundation and the walls. It was a lovely spot to take a break from our hike. We re-fuelled on some nice hot crowberry tea and a bite of fresh bannock baked by a local Inuk lady, before heading back home over the bay. Hey guys! I need to ask you guys for a favour. My band has entered CBC Music's Searchlight Competition for dreams of rock and roll fame. To make it to the next round, we need to get the most votes possible. Please go to the CBC contest website for the Nunavut region and vote for my band Scary Bear Soundtrack. And then vote again tomorrow. And then the day after that. Thanks! Oh crap, I said to myself as I slammed my body into the door over and over again. I think the lock is frozen. Living in the Arctic Circle presents all sorts of different challenges and rituals that a Southerner like me would never even imagine. For example, just last Friday, I may or may not have driven off with the company vehicle while it was still plugged into the wall. I forgot to take out the extension cord, okay? Back at home in tropical Ottawa, I never plugged my car in. Here, your car will never start again if you leave it unplugged, or turn the engine off when you're only getting out of the car to do something simple like grocery shop. And here was my new problem. I had offered to cat-sit for a friend while she was out of town for a week. I had heard (but not really paid attention to) her stories before about how her front door lock would occasionally freeze. And now here I was: turning the key with all my might, with the lock not budging one millimetre. 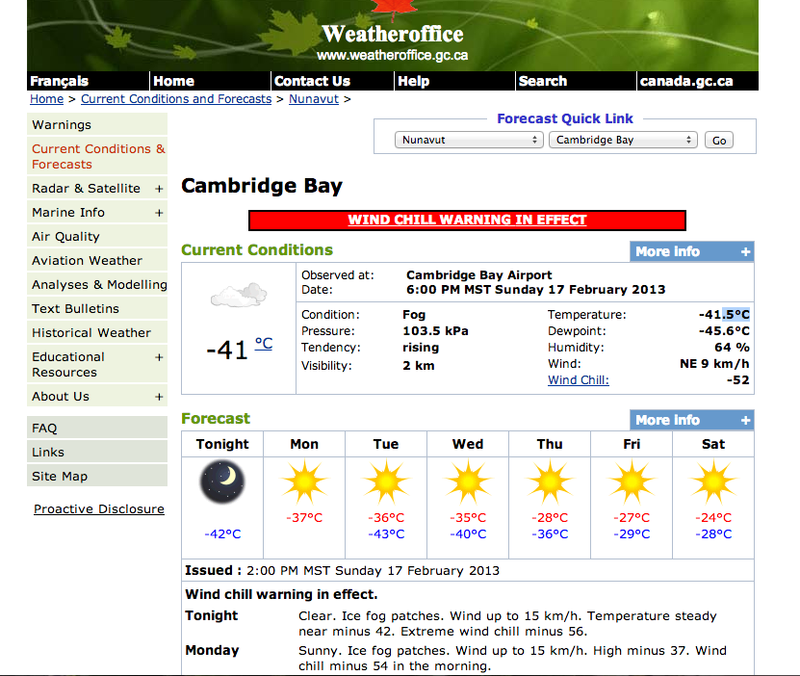 Part of the problem was that it was so damn cold outside that day in Cambridge Bay: -42°C without the windchill, and -56°C with. I was wearing big gloves that were very warm but bulky; to do any sort of meaningful manoeuvring, I had to take my gloves off and work the key with my bare hands. My first time ever experiencing a freeze-burn, by the way, was when I grabbed the frozen door handle with my bare hands. Classic rookie mistake. It's so cold outside that exposing your bare skin to the cold for more than a few minutes is unwise; you'll notice the excruciating pain that sets in. Sometimes I think about how blissfully naive I was, when I was living in balmy tropical ol' Ottawa where people would freak out if the temperature dipped past -20°C. My first instinct was, selfishly, to just ignore the problem and go home. Let the cats find some way to survive for the rest of the week. My will to keep trying to open the door was rapidly fading, as the weird freezing-burning feeling set in. But no, I couldn't do that. I pretend to be a villain, but I could never neglect a cat. So I did what any smart, resourceful person would do: I went home and told my husband to solve the problem. My husband, also being a smart resourceful person, suggested we call my colleague. We called her up to see if we could borrow the company truck, Yes, the same truck that I had driven off with just a few days earlier while it was still firmly plugged into the wall. Despite this, my colleague was all cool about using the car, except that it hadn't been plugged in all weekend, and needed to be warmed up. I forgot about that. You need to plan things at least half an hour in advance here, to make sure the car is ready to drive. (Also, when I say "car" here, I mean "truck". 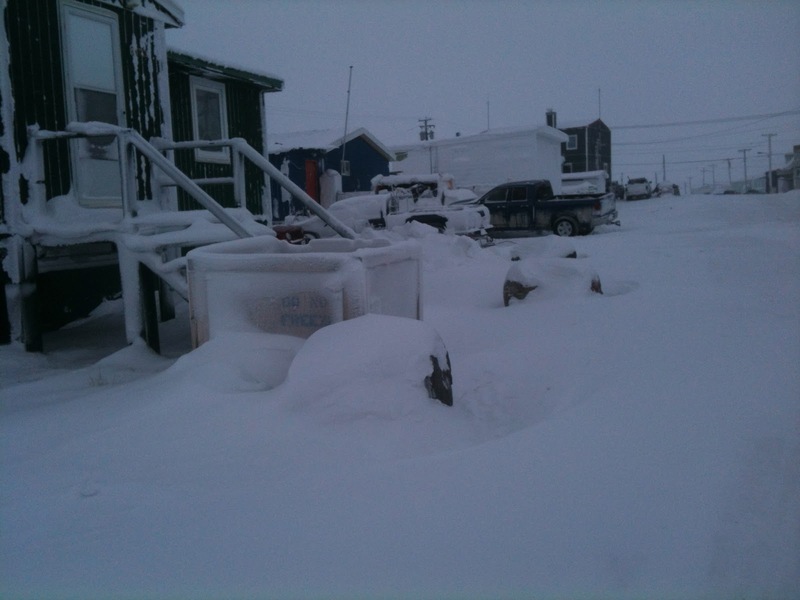 There are no cars in Cambridge Bay, just trucks and snowmobiles. But I digress.) Even once the "car" was running, and even once we remembered to unplug it from the wall, we still had to figure out how to deal with a frozen front door lock. Luckily, my colleagues had an idea. "Blow-dryer," she said. She wasn't joking. Plug a hair-dryer into one of the outdoor outlets and point the hair drier at the lock, blow-dry until it thaws. Genius. My colleague also had lock de-icer (a product I had never heard of before, because I come from tropical Ottawa), but the problem was that with this cold, it might actually freeze. And so there we were, standing on the front porch, blow-drying the front door lock, looking out at the last rays of the setting sun. The thawed lock finally turned. I went inside and fed the cats, who were excited to finally see a person, any person. We scraped the ice off the doorframe before closing the door again, so that it wouldn't become jammed. It's just an average Sunday night in Cambridge Bay. With the big regional trade show in town, Cambridge Bay has been bustling all week! There isn't a single vacancy, and there have been festivities every night. On the second night, there was a big event happening in the gymnasium, including a fashion show, so I decided to check it out. It wasn’t hard to figure out where everything was happening – it seemed like every car in town was parked at the elementary school. The first performance was dancers. I thought, Man, I am curious to see what traditional Inuit dancing looks like. Imagine my surprise when the dancers poured into the middle of the gym and began square dancing to country folk songs. Straight up square dancing, about ten dancers varying in age range from very little kids to older adults, weaving and bouncing to fiddle music, complete with Yee-haw's punctuating each line. When Scottish whalers first met Inuit people in the 1800s, there was a sort of cultural exchange that happened along with the usual material trade. The Inuit taught the whalers some important skills for surviving in the winter, and the whalers taught the Inuit some of their folk songs and the dancing that goes with it. As a result of these friendly interactions, stuff like Scottish folk music and square dancing have become an accepted part of Inuit traditions, and people seem to love it. Then we were treated to performances by the Ikaluktutiak drummers, a group of talented young women who showed off their talents in singing, drumming, and dancing to short songs. There was an adorable little girl who stole the show, doing every move perfectly, holding a drum almost the same size as her. There was something truly haunting about the sound of women singing a capella, accompanied only by drums. One song had beats of four, with each beat to represent the people of the Arctic: Canada, Greenland, Russia, and Alaska. Another song involved a bird dance, with each lines punctuated by bird-like chirping sounds. I was impressed by how many songs they knew by memory. The way that the performers explained it to us, throat singing is sort of a friendly competition held between two women, holding each other closely, with one woman leading and the other following, producing incredible rhythmic sounds from their throats until one of them can't keep up or the other breaks away laughing. Kind of like a staring contest, except throat singing requires remarkable talent and practice, compared to staring. The girls performed songs that imitated different aspects of nature, like the buzzing of mosquitos, or the barking of dogs, or the cawing of birds. The last song was my favourite. It was about a girl singing to her puppy, hoping he grows up to be the leader of his dog pack one day. After the two throat singers left the stage, I thought, how could they possibly follow up that act? The answer: A blind Inuk violinist. I am not making this up. I've seen Ashley hanging out at the library before. He's always there. The emcee led Ashley up the stage and helped him sit in his chair. Ashley then effortlessly tuned his violin on stage and launched into a fast-paced fiddling tune, the same kind of music that the square dancers had been dancing to earlier. He had the whole audience clapping along. Then he put his bow away and began strumming chords on it like a mandolin, humming along. Watch out, Andrew Bird, watch out. This self-taught blind Inuk violinist just might overshadow you. The final act was the fashion show, presented by the Nunavut Arts and Crafts Association. It wasn't the kind of fashion show you'd see on the runways of Milan, presenting the latest Gucci or whatever name I can drop to make myself seem like I know high fashion. This was a display of the latest fur/leather fashions made by the local designers of Nunavut, beautiful outfits skilfully interweaving modern fashion trends with traditional fur skills that would have made a fashionista weep with joy. It probably also would have made a PETA activist weep too, for different reasons. Especially when the fashion models concluded their presentations by flashing their T-shirts that read: "SEAL IS THE NEW BLACK." I approved. We get some breathtaking sunrises here in Cambridge Bay. Right now the sun comes up just as I'm walking to work. Once in a while I'll share some of the scenery shots. frozen playground on a foggy day Happy Valentine's Day! What’s it like working in law in the Arctic, you ask? Ever watch the law drama The Good Wife? It’s exactly like that. Except instead of pantsuits, I wear snowpants. And instead of drinking a glass of wine when I get home, I drink Inuit tea. So here's a little bit about what it’s like to work in one of the northernmost law offices in North America, along with some photos from the walk I take to work every day. The commute. My commutes to work are very short and very beautiful, involving walking along a frozen beach at sunrise. The wardrobe. My officewear tends to be quite formal and my morning dressing rituals are quite elaborate. “Is today going to be jeggings or Lulelemons? Which hoodie should I wear today?” Plus Airwalk sneakers with purple shoelaces. (One day, when I’m a bigshot lawyer, I’ll splurge on Converse shoes.) Sometimes, when I particularly feel like dressing up, I wear a….No, I don’t. I never feel like that. The clients. The majority of my office’s clients are Inuit folks. Sometimes Inuit artists stop by my office, just to say hi and sell their carvings, which is kind of nice, since usually people just come to see us when they have problems. The law office. We’re in a downtown all-glass office on the twenty-second floor of a tall skyscraper owned by TD Canada Trust. A lot of expensive art on the walls, and a whole row of support staff fetching us lattes. Psych! (Do kids nowadays still say psych?). We’re on the bottom floor of a two storey building, the second floor being residential units. We’re across the street from the meat plant. There’s a fancy Keurig coffee machine that makes my day amazing. When we lock up at night, we have to scrape off all the ice that’s formed on the doorframe so that the door can properly shut. We have an office vehicle, a big red truck, that we have to turn on and leave running every once in a while to keep it going through the cold. We do have great art on our walls, actually, prints from Inuit artists. We have a big map of Nunavut on one of the walls, and every once in a while, I look at it, realize how far away some of our clients live, and I laugh in amazement. The ability to stream Youtube when you want to procrastinate. Nope. Office scotch? Nope. That would be cool though. Some people have been asking me about the food up here in Nunavut. With horror stories from websites like Nunavut Food Prices, I was curious myself what my diet was going to be like coming up. While availability, selection and price varies from region to region and time of year, here's a snapshot of my grocery shopping experience with these exhibits. When I first moved to Cambridge Bay, I was advised not to complain publicly about the price of food, because nobody wants to listen to that new guy in town griping about how it was so much better at home. And to be honest, I’m pleasantly surprised with the selection of food that is available, given the fact that Rob can have his favourite brand of Japanese ramen, I can have my avocado, there are frozen spring rolls and kale chips, and these oranges are being flown in from…where, Florida? And where are these mangoes coming from? As you can see, the price of food here is roughly similar to the grocery shopping at the gas station down south, with some notable exceptions (such as meat). That’s not so bad, right? There’s a couple things to keep in mind though. One, many of these prices are actually the subsidized price – that is, the government puts in money to lower the price, so normally, the price of these items would be even higher. Secondly, while I might grumble about the price of cheese at sixteen dollars and meat at sixty, the reality is that with my job I can afford to pay that price, even if I’m not used to. My neighbours down the road, however, earning only a couple hundred dollars a month on social assistance still have to pay the same price for food. It boggles my mind to try to figure out how some folks manage to feed their family of five within their budget. There is also the issue of trying to eat healthy. I’ve always been an advocate for eating fresh, local, and organic whenever possible. (Which makes everyone wonder why I keep moving to the desert, like Subsaharan Africa and the Arctic). You can imagine it would be a bit more difficult doing that here, especially in the dead of winter where everything’s frozen. Also, I have no idea how vegans would get by around here – not that I’ve met any. It’s been challenging enough for me, as an Asian who is accustomed to eating Asian food every day. Traditionally, the Inuit had a pretty healthy diet. There’s nothing more fresh, organic, and free of chemical preservatives than Arctic char that you’ve caught yourself. Narwhal meat contains the same amount of vitamin C as an orange. “Country” food is still considered to be pound-for-pound the most nutritious thing you can get here. Wouldn’t it be better for Inuit families to just hunt muskox like the old ways, instead of paying high prices for less fresh food at the grocery store? Unfortunately, things are not the same anymore. Living off the land was a lot more possible for Inuit people when they were able to lead a nomadic lifestyle, following the migration patterns of the caribou and other wildlife. Now that, after European contact, they have been settled into permanent communities, it’s a lot harder to hunt the same way. Inuit hunters often have to travel much further, hundred of kilometres, to track down their food source, and then travel that distance back to get to their homes in the town. Adaptations have been made, of course, to try to deal with this – Inuit hunters hunt with guns now, and there’s a government subsidy program that gives snowmobiles to hunters. But the truth still remains – living on country food alone is still costly, time-consuming, and just not a reality for most people. This leaves a lot of people in Nunavut caught between a rock and a hard place. The price of food has become a hot topic political issue in Nunavut, as can be seen in recent protests at Iqaluit grocery stores and the recent forum on food security in Nunavut. And it is an important issue that Canadians need to be informed about. We know from the television news about the starving children in Africa or North Korea, but many of us forget that right in our very (conceptual) backyards, there are Canadian children suffering from malnutrition. EDIT: The CBC released this related article on food security in Canada today.